Are you looking for a quality leather sofa but don't want to spend thousands of pounds? Would you like the chance to purchase a pre loved sofa that is in excellent condition? Pre Loved Sofas & Chairs in Lytham St Annes, Lancashire specialise in sourcing high quality sofas and chairs. These were expensive when new, have been lovingly cared for and now are a fraction of the price. Don't want to spend up to £3000 for a new suite but are happy to spend £300 to £400 for a suite that looks almost new? Come to Pre Loved Sofas & Chairs Ltd in Lancashire. Some of our sofas are only 3 months old. 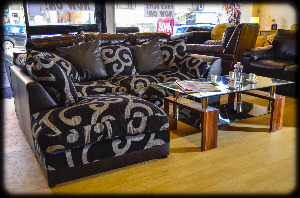 Our fabric sofas are professionally cleaned and leather sofas are conditioned & cleaned. This brings them back to look almost as good as new. Recent brand names include G Plan, Parker Knoll, La-Z-Boy, Bridgecraft, Vale, Duresta, Stressless, Natuzzi and Himola. Our vans travel all over the north of England, North Wales and the Midlands. This brings us the best examples of pre loved sofas that we can find. Coming mainly from people who are moving home, downsizing or changing their decor. Preloved Sofas & Chairs Ltd stock sofas for all rooms. Games rooms, children's rooms, cinema rooms, conservatories and finally sofas for pets. Whatever you need, we are sure to have the right sofa for you. Our customers vary. From young couples setting up their new home to senior citizens who don't want to take thousands from their hard earned savings. We offer free delivery and we will even part exchange your old sofa, or take it away if it has passed its usefulness. The store is open from 9:30am to 5:30pm Monday to Saturday, with supplies of new stock arriving daily. If you want to buy, sell or part exchange, pop in, there is always a warm welcome. If you'd like to give us a call 0800 025 7689, or you can fill out a contact form.